What does it take to become a strongman? Well, we're glad you asked. First —Eating a dozen raw eggs every morning is supposed to help you get pretty pumped up. We heard that from a cartoon musical, it has to be true. Next —Try some form of lifting weights. We've seen old timey photographs with guys using medicine balls. That should probably work. Last and most importantly— Have the right facial hair. If you kept down the eggs and you've been working out for a few days then you're almost ready. All you need now is the rugged Carnie weight lifter facial hair. Lucky for you, you don't even have to grow it. Go on, just focus on those bicep curls, we'll send you the hair. 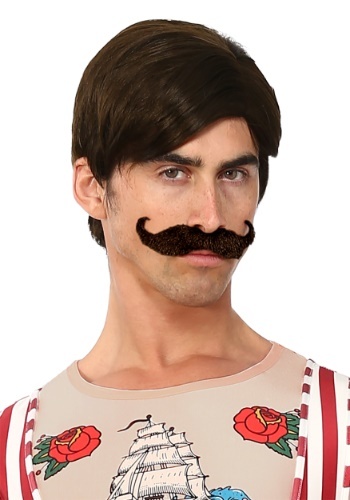 This wig and mustache set will have your back, even if you throw it out while trying to flip that tire. Hey, didn't anyone ever tell you to lift with your knees?